It’s evident this season that the Boston Celtics have really underperformed offensively. You could look at the state of play and say that Kyrie Irving, Al Horford, Jaylen Brown and Jayson Tatum have exceeded everybody’s expectations so far; but the reality is that these four players are literally the only ones offering an offensive threat. It’s a huge drawback for the Celtics not having much beyond the four players named above, and it means that they are carry a lot of responsibility too. 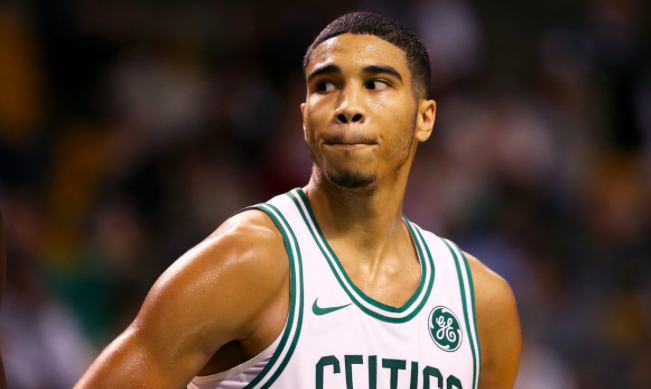 Many people suggest that Jayson Tatum could be the key to improving an underwhelming Celtics offense, and it’s clear that the player has a lot more to give in terms of ability. If he was afforded a more prominent role within the team, it will be almost impossible for him not to further develop as a player. He’s already a great finisher and he seems to be able to finish from anywhere. His efficiency and effectiveness really makes him stand out, but the problem is he is rarely the real focal point; and this sees him not able to have as big an impact as many think he is capable of. At 19 years old, Tatum is certainly still a rookie and you could say it’s maybe unfair to demand a lot of him but let’s face it, Tatum is far from the average rookie. He plays like he has been playing basketball for years and unlike other rookies, he doesn’t make the sort of mistakes that players who have just made the breakthrough seem to make. The Celtics certainly need to try and improve their offense, and giving Tatum a more prominent role will not only help the team; but will help him as an individual in unlocking his undoubted potential. You could say that giving Tatum the chance by letting the handbrake off so to speak isn’t really that big of a risk. He’s not the greatest distributor, but he creates space well and has proven time and time again that he only takes shots on when he’s in a good position; and does so with remarkable efficiency. Furthermore, most respected sports betting brands like Unibet already have the Celtics 1/7 odds on favurites to win the Atlantic Division and 5/2 second favorites to walk aways with the Eastern Conference; so this could be the perfect time to make his mark. There’s no doubt that Jayson Tatum is a real special talent and that he will go on to be a real top player, probably sooner rather than later. He does need to unlock his full potential though and this will only happen when he’s given a bit more freedom on the court. With the Celtics failing to impress offensively, you can certainly see Tatum getting a chance to show what he can really do and he’s likely to repay head coach Brad Stevens with even more stellar performances.